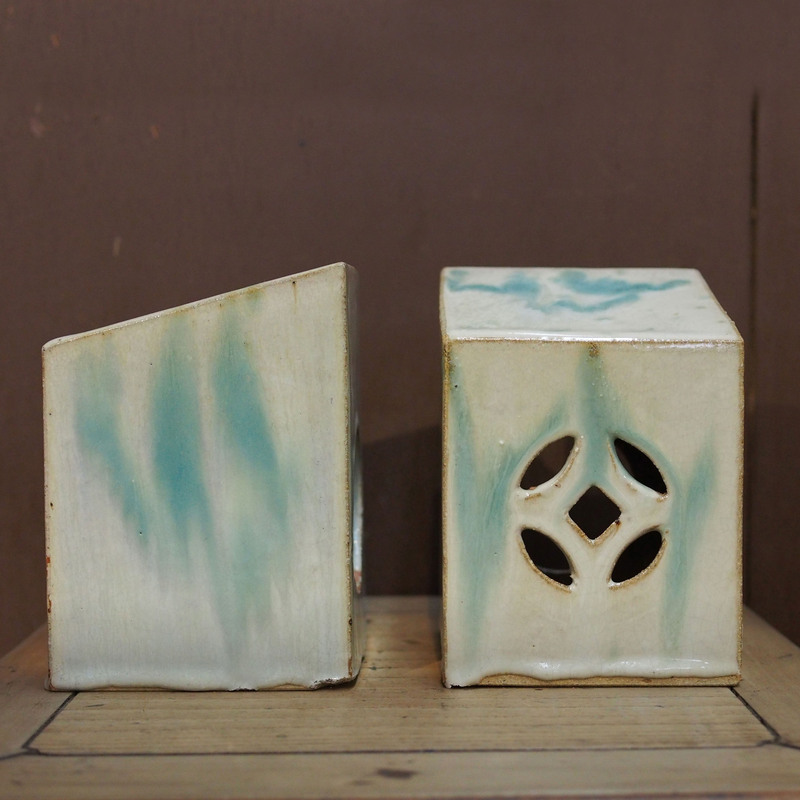 This pair of very architectural objects are in fact a pair of ceramic pillows! 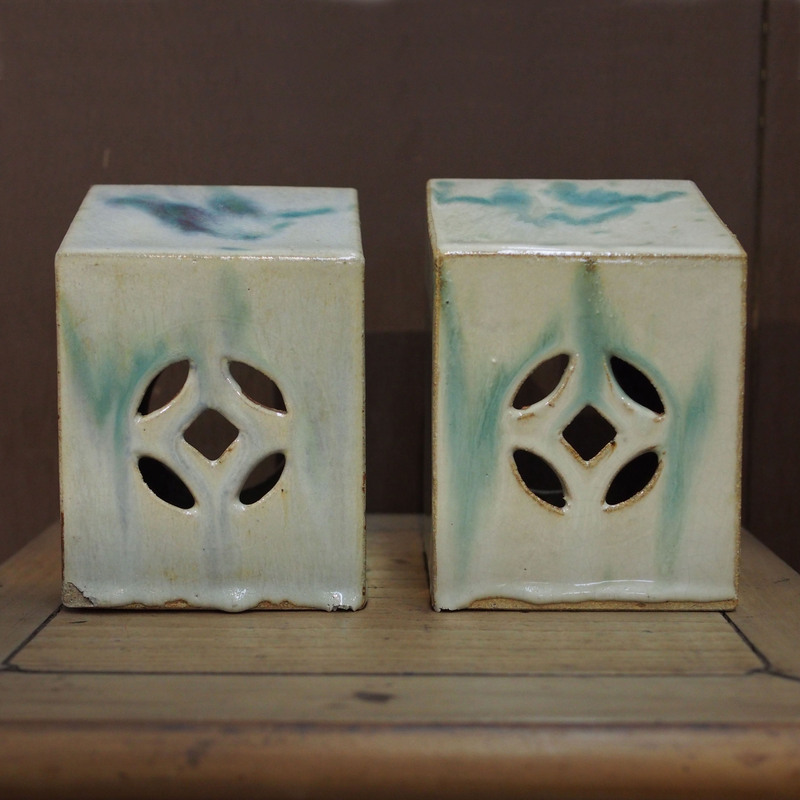 They have a running glaze which is typical of the Shi Wan kiln, used for smoking opium, the airing holes which forms a pattern of an antique Chinese coin are used for ventilation, helping to keep the pillow cool. I probably would not be able to be parted from the Tempurpedic but these would make lovely book ends. 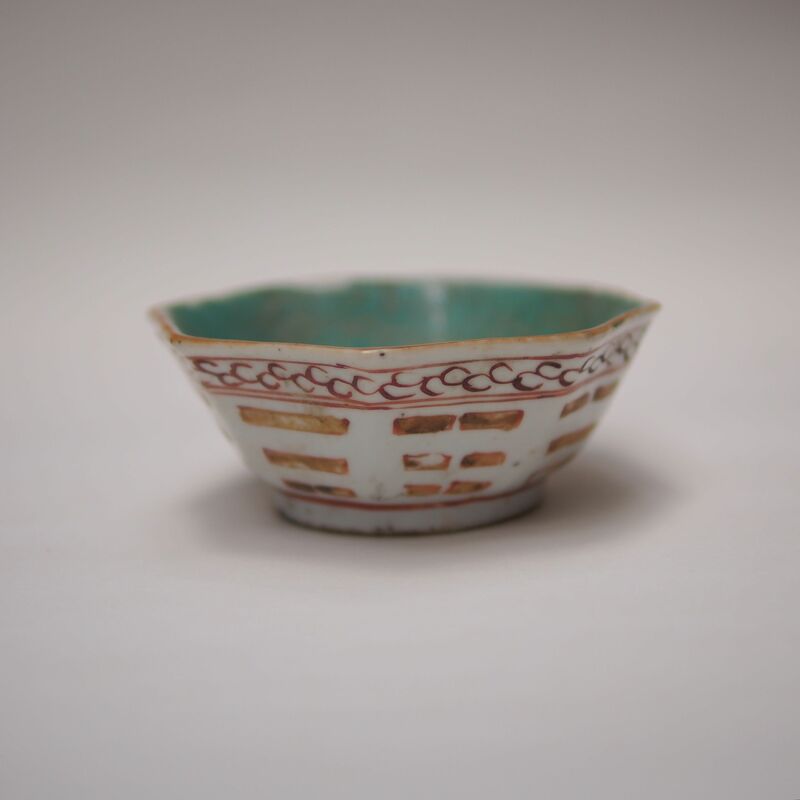 This pottery bowl was used as a container for Taoist offering. The horizontal line pattern on the bowl are trigram figures from the I Ching, on each face of the octagon bowl are the pattern; 乾 Qian, 兑 Dui, 离 Li, 震 Zhen, 巽 Xun, 坎 Kan, 艮 Gen, 坤 Kun. These 8 trigrams correspond to 8 nature phenomenon, namely, Sky, Lake, Fire, Thunder, Wind, Water, Mountain, Earth. From the 8 trigrams found by Fu Hsi, 64 hexagrams was developed capturing more natural phenomenon and human events,it was later used for prediction of events. 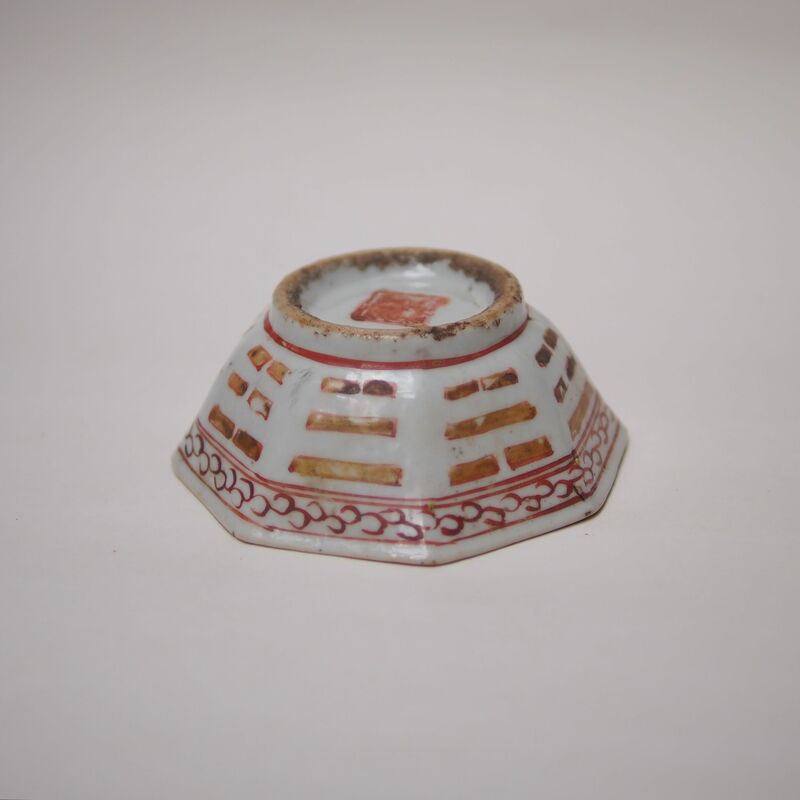 From the Yuan dynasty, trigrams pattern were introduced to ceramic decoration and flourished in the Ming dynasty. 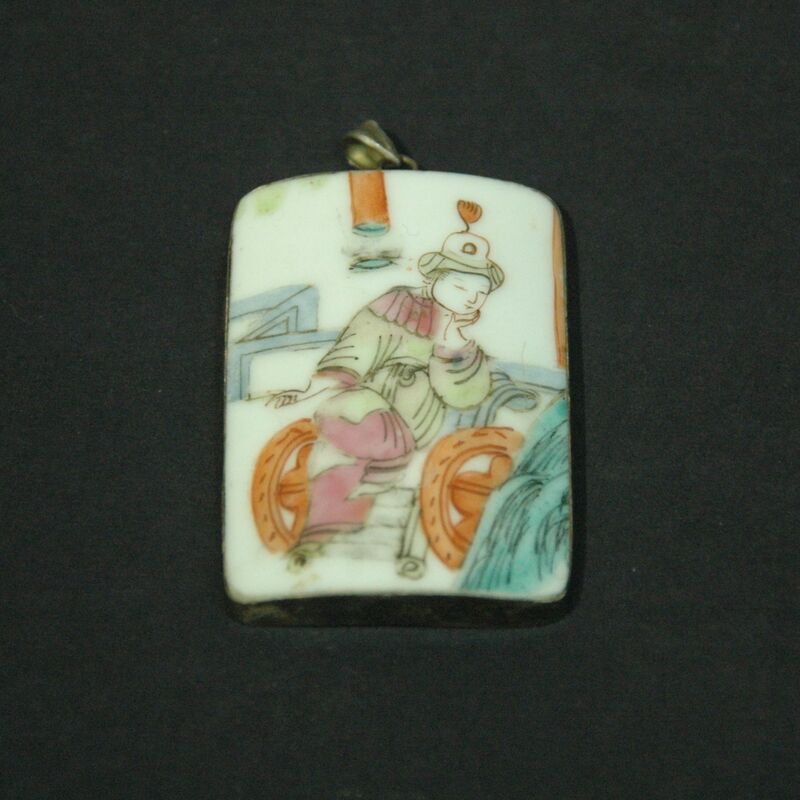 This pendant is made from a piece of broken ceramic, from the shape of the piece it is likely to be of a medium size jar or a vase. 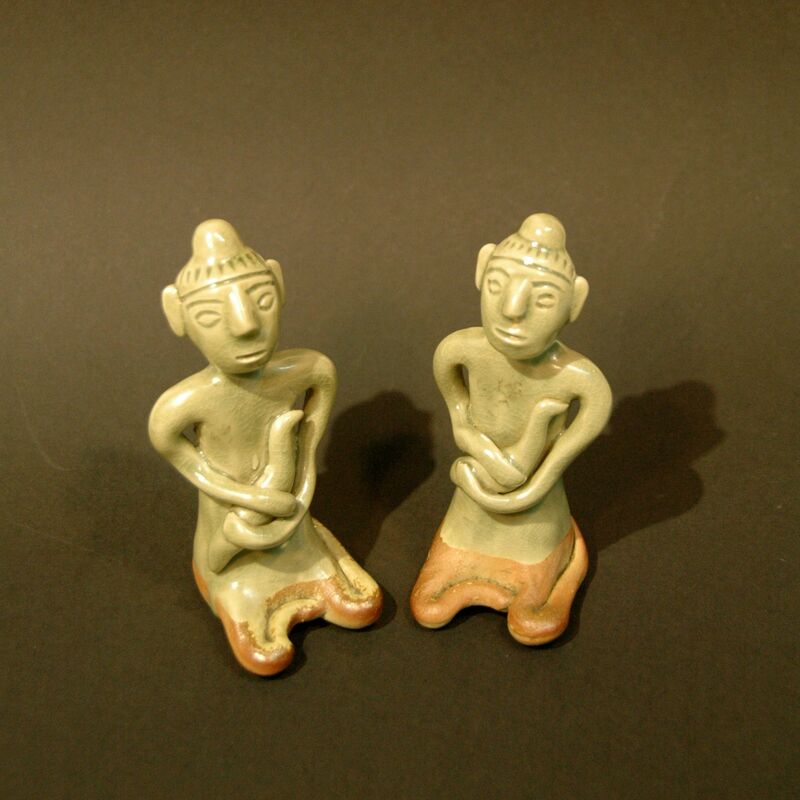 The figure on the piece is part of the a war story, these figures or themes are known as Knife-Horse-People which is a popular theme in the Qing dynasty. See here for the clay version of Knife-Horse-People. Though completely different, this ring seems like part of the portrait jewellery collection. 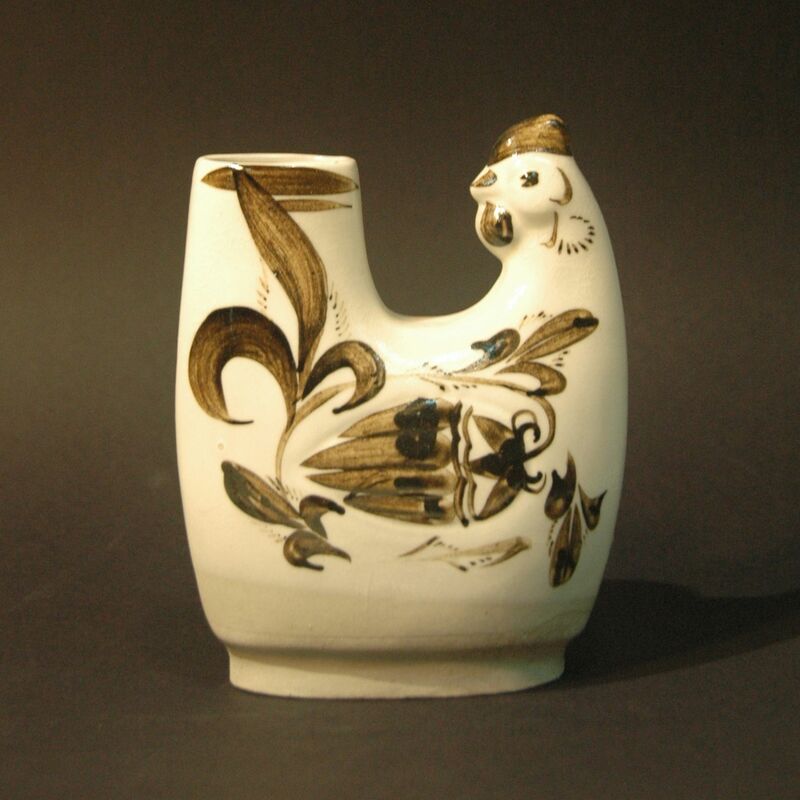 To continue with the chicken theme, we have a flower vase from the Ci Zhou kiln. Ci Zhou kiln is the largest folk kiln in northern Chinese which dated back to the Song dynasty; it is famous for its black on white pottery (no, I did not set the camera to nostalgic tone) which was a break through in glazing tradition at the time, some believed that it set the foundation for the now well known blue and white porcelain ware. White slip is applied to the semi dried clay work, a iron based black slip that contained iron is painted over to add detail to the vase, a clear glaze is applied after the first firing. Unlike the pen holder we have nowadays where all the stationary collection is stored, the Chinese pen holder is for the storage of calligraphy brush alone. 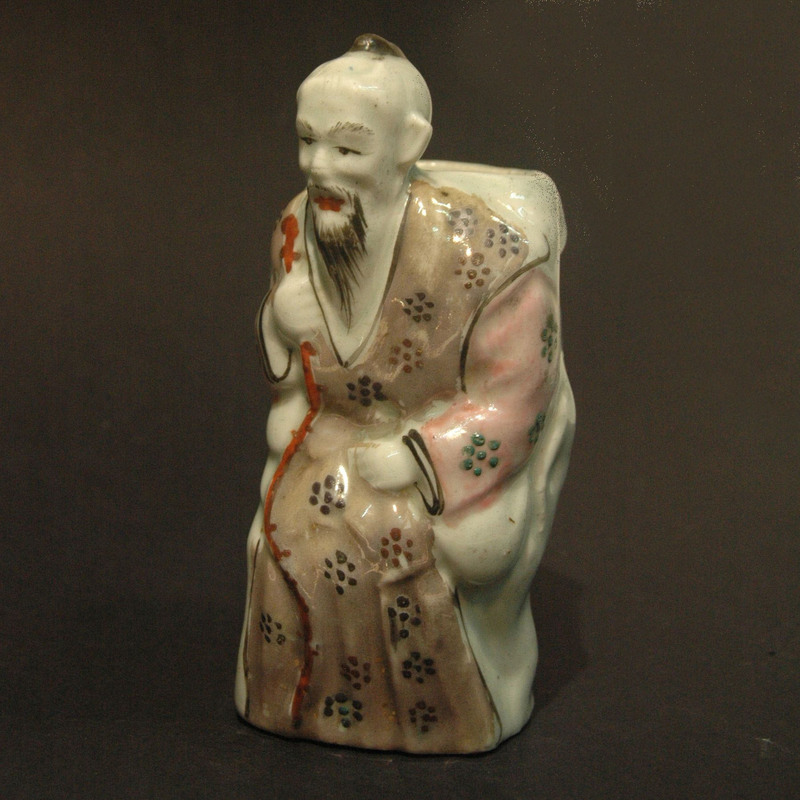 This penholder is in form of a old man sitting on a piece of rock. These are roof ridge tiles called the cat shingles, in the Yun Nan area each house would have one placed on the center of the roof ridge with its back toward the courtyard and facing the outside. Although they are called cats, they are actually resemble tiger (you can see this by the 王 sign on their forehead, this is a symbol for all the Chinese tiger figurines). 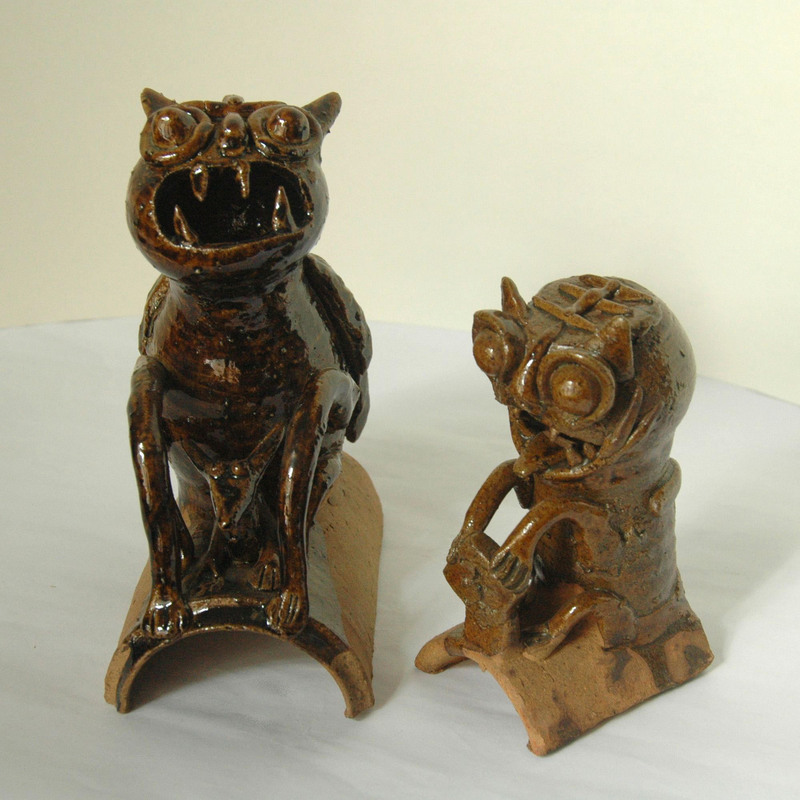 It is believed these tiger figurines are capable of protecting the household by eating up all the demons and bad feng shiu. On the day when the cat tile is set on the roof, a special ceremony will take place (on a even number day in lunar feb or aug) which involve feeding the tile cat dates and nuts, a sprinkle of chicken blood, chants, incense, burning of paper, followed by member of the family petting the cat and finally the awakened cat will be placed on the ridge. On the 1st and 15th of every lunar month, incense will be offered to the cat. Children like creating sounds and Chinese children are no different, in fact sound making toy is a category by itself! What can more desirable than a portable cute looking figurine that can make beautiful sounds! Both of these whistles have a tail at the end as a mouth piece, the second hole for generating the sound is located at the bottom. 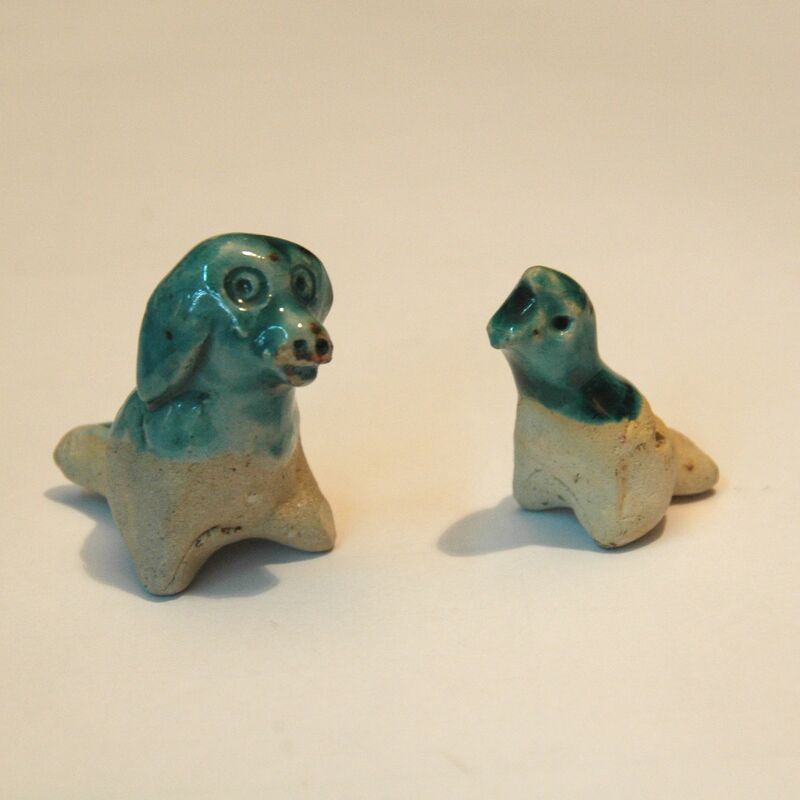 These ceramic whistles are in the shape of a dog and a bird. These ceramic moulds are for making Guo. The guo is a Chaozhou dumplings made with a thin rice flour dough with fillings of different types vegetable, nuts or beans that can be savory or sweet. Guo is made for Chinese New Year, all other festivals, harvests and all events in life (birth, adulthood, marriage, death). Different guo are made for different events; the red peach guo for new year, vegetable guo for spring and autumn festivals, rice plant guo for harvest. The moulds are made of different patterns for this purpose; the turtle and the peach for birthday – represents longevity, the fish is synonymous with excess (to have more than enough), bat synonymous with blessing, etc. 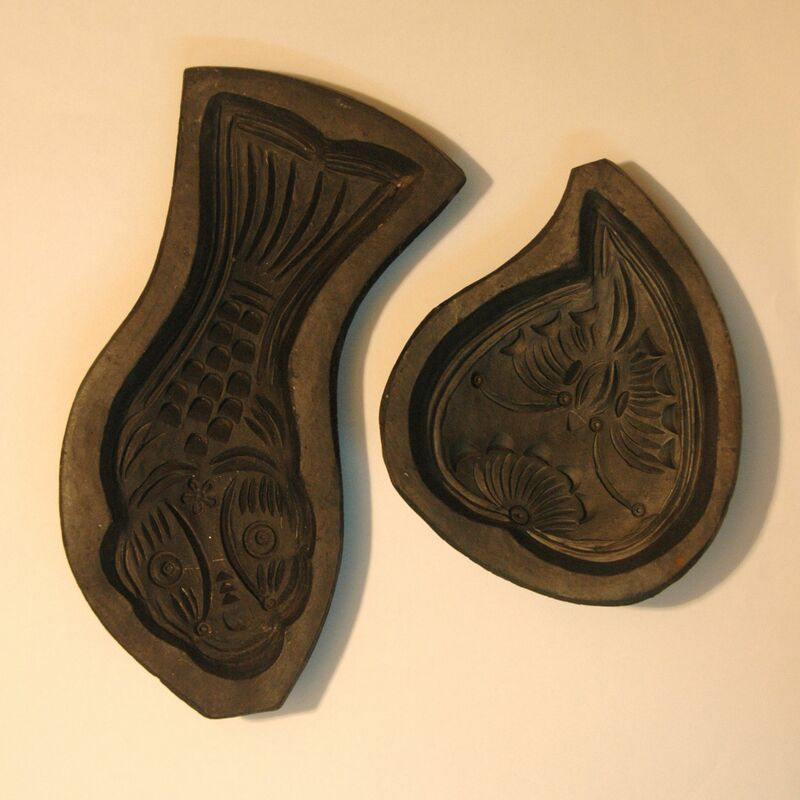 These moulds can be of wood or ceramics.